Nanette and I have been chatting up Gelato for over a good month now, this is an evil in itself. We were going to make this Turkish Coffee Gelato recipe a couple weeks ago but we decided we should wait a couple weeks after our last gelato adventure; I thought my waistline could use a wee break. Nanette found this wonderful recipe in her Arabesque cooking book. What I am loving about these gelato recipes is that they are amazingly easy to make as well I like that they are lightly sweetened, which in turns bring out their true flavors – this one was the coffee! 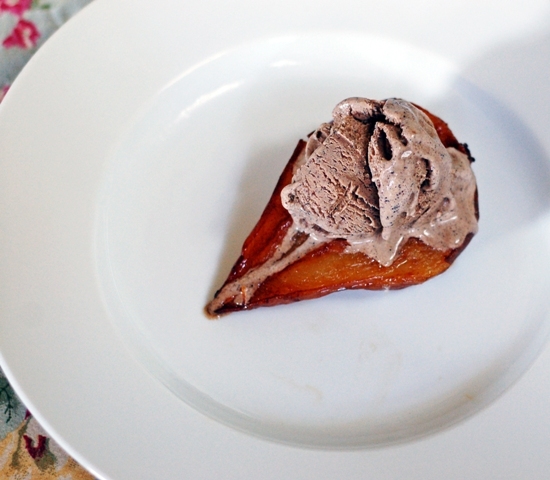 Being in our winter months in the States, I decided to serve my gelato with a roasted pear. I lightly glazed the pear in a little melted butter and lavender honey and then roasted it until slightly soft but golden in color. The warmest of the cardamon and the slight bitterness of the coffee really melted into this roasted pear, the perfect companions. My sweet friend, Nanette, being in the warm spring days of Australia, served her dish with seasonal berries which would also go very nicely with this gelato. Regardless, it is so delicious and creamy, that all you really need is a spoon! Place the sugar, water, glucose, cardamom, and coffee in a saucepan and slowly bring to the boil, making sure the sugar dissolves completely. Simmer for 5 minutes then pour over the chocolate and stir until it melts. Whip the egg yolks at high speed until they are light and fluffy. Strain the coffee chocolate mixture through a coffee filter into the egg yolks and beat for a minute. Pour into ice cream machine and process accordingly to your directions. 7 Responses to "Turkish Coffee Gelato"
This sounds super delish! I've been dying to make the chocolate gelato that Nanette posted a few weeks ago... Now i've got another one of the list. I would very much like this to magically occur in my freezer, or at work at this moment. I'm really loving making gelato & ice-cream with you too Denise! But if we keep this up we may have to add extra spin classes to our weekly workout! Maybe we should move on to sorbets? oooo, looks so so good, even though I'm freezing in my cold office right now. And that pear looks familiar... :) I really need an ice cream machine. Think I'm gonna ask Santa for one this year.